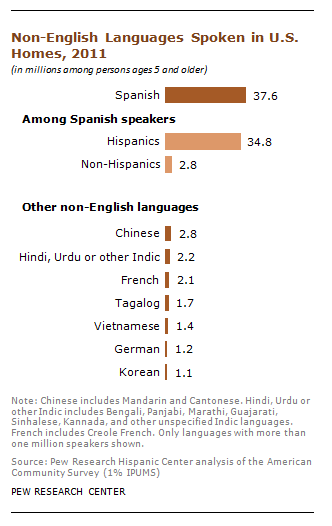 A record 37.6 million persons ages 5 years and older speak Spanish at home, according to an analysis of the 2011 American Community Survey by the Pew Research Center. When it comes to English proficiency, eight-in-ten (80%) non-Hispanics who speak Spanish at home say they speak English “very well”, 11% say they speak English “well”, and 9% say they speak English “not well” or do not speak English. This compares with 96% of all non-Hispanics 5 years and older who speak English only or speak it “very well”, 2% who speak English “well”, and 2% who speak English “not well” or do not speak English.